A uniquely Botany sound is taking to the airwaves. Botany FM (107.1) is the only radio station to operate out of a shopping centre in Australasia, owner John Lehmann says. 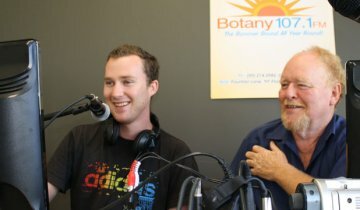 Rhys Tau and John Lehmann at Botany FM. The experienced broadcaster says the station was "born out of necessity". "It's clearly in demand from the feedback we are getting from retailers and the public." He says mainstream radio is "too impersonal". "I know the Auckland market is inundated with stations of various types but it's like anything – you give people what they want, and we are obviously doing the right thing. "Because we are community-based we get in touch with people, for example if you lose your cat and you call other stations they would tell you to bugger off, but here we will try to get the cat found." The station has a catchment of 140,000 people from the eastern suburbs to Redoubt Rd in Manukau. Mr Lehmann says it encourages residents to support businesses in the local area. Botany FM will feature a community bulletin board for local sports groups, churches and organisations to announce events, news and job vacancies. A weekly timeslot will host a police officer talking about issues in the area. The 25-year-old Farm Cove resident says he wants "old-fashioned town hall" political debates where listeners can email in and questions will be put to candidates on air. The station is manned by six presenters during shopping hours and broadcasts 24 hours a day. It plays music from the 60s to the 90s to cater for people aged over 25. After three weeks on air the feedback has been "absolutely fantastic". "You get a certain warm feeling knowing you're appreciated and I think all the announcers are getting that feedback." "Everyone feels what we are doing is worthwhile and it's our way of contributing to the community," Mr Lehmann says. Call 274-2986 or email studio@botanyfm.co.nz to contact the station. © Eastern Courier January 28 2011.